im working on a hitch mounted smoker to tailgate with. drafted up a design on Inventor today. ill post some pics when i get any. Apparently all my pics. are too big. Very nice work. I need to weld something up, but I got welders block right now. I also just finished a mobile base for my drill press, but I didn't take any pics yet. Here are some pics of a cutoff saw stand for an Evolution 355. The right hand table wing is held up by a folding support arm and includes a pull-out extension. The unit is mobile to save shop space, pull out handles are used to move it. One foot is adjustable to accommodate irregularities in the shop floor concrete. Attached to the support table wing is a folding ruler that give quick approximate readings for fast cuts. There is a small slide-in chip deflector just to the right of the blade to keep the metal chunks from flying all over. There is a 3/4" plate on the bottom to act as ballast to prevent tipping. I've used this setup for about 2 years, works really great. Wow, I didnt know that alluminum ramps would have the capacity for that much weight. What are they rated for, if you had to guess, besides the weight of your truck, and safe operating weight? Hey Weldnut; those recumnents are exctly what I have been looking for in design for over a year looking on different recumbent bike forums and recumbent manufactures. Your green bike has my eyes sore from looking at it so long, that is exactly what I would want to build it's perfect for me bar none. Production bikes are way overpriced besides not what I like. I have been collecting parts for this project for a long time. Do you have any information, specs and measurements for me to exactly copy and build that green bike? Is this is ok with you? A full parts list would be great. This down to the gearing, seat everything if possible? Make it for a recumbent noob to understand and build. I have a bad back so the my road bike days are gone. One recumbent I tested had the handle bar under the seat, this was all wrong in the handling department, hated it. Short wheel base is also wrong for me. Is it critical the stearing head angle and dimensions resulting from making an ok to building a great handling bike in the stability department? R90scj@alamedanet.net Thanks and have a safe holiday weekend. Last edited by Carl W.; 11-29-2008, 02:55 AM. 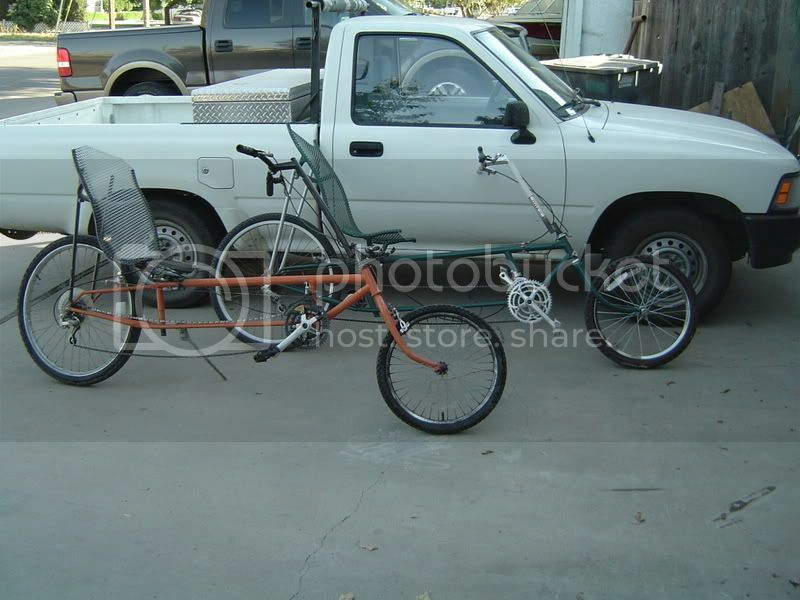 Glad you like them .I've built seven so far,And sold a few.Just one of a few hobbys that I have.The orange bike has under the seat stearing now and the green bike was sold .I hated to see that one go .You can get all the Info on these bikes and how to make them at ://www.recycledrecumbent.com/ Have fun It's a great sight.